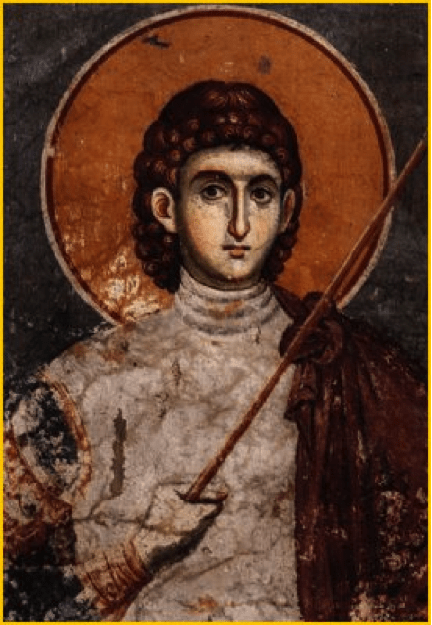 Today we commemorate the The Holy Great Martyr Procopius, in the world Neanius, a native of Jerusalem, lived and suffered during the reign of the emperor Diocletian (284-305 AD). His father, an eminent Roman by the name of Christopher, was a Christian, but the mother of the saint, Theodosia, remained a pagan. He was early deprived of his father, and the young child was raised by his mother. Having received an excellent secular education, he was introduced to Diocletian in the very first year of the emperor’s accession to the throne, and he quickly advanced in government service. Towards the year 303, when open persecution against Christians began, Neanius was sent as a proconsul to Alexandria with orders to mercilessly persecute the Church of God. On the way to Egypt, near the Syrian city of Apamea, Neanius had a vision of the Lord Jesus, similar to the vision of Saul on the road to Damascus. A divine voice exclaimed, “Neanius, why do you persecute Me?” Neanius asked, “Who are you, Lord?” “I am the crucified Jesus, the Son of God.” At that moment a radiant Cross appeared in the air. Neanius felt an inexpressible joy and spiritual happiness in his heart and he was transformed from being a persecutor into a zealous follower of Christ. From this point in time Neanius became favorably disposed towards Christians and fought victoriously against the barbarians. The words of the Savior came true for the saint, “A man’s foes shall be those of his own household” (Mt. 10:36). His mother, a pagan herself, went to the emperor to complain that her son did not worship the ancestral gods. Neanius was summoned to the procurator Judaeus Justus, where he was solemnly handed the decree of Diocletian. Having read through the blasphemous directive, Neanius quietly tore it up before the eyes of everyone. This was a crime, which the Romans regarded as an “insult to authority.” Neanius was held under guard and in chains sent to Caesarea of Palestine, where the Apostle Paul once languished. After terrible torments, they threw the saint into a dank prison. That night, a light shone in the prison, and the Lord Jesus Christ Himself baptized the suffering confessor, and gave him the name Procopius. Repeatedly they led St Procopius to the courtroom, demanding that he renounce Christ, and they subjected him to more tortures. The stolidity of the martyr and his fiery faith brought down God’s abundant grace on those who witnessed the execution. Inspired by the example of Procopius, many of the holy martyr’s former guards and Roman soldiers went beneath the executioner’s sword together with their tribunes Nikostrates and Antiochus. Twelve Christian women received martyr’s crowns, after they came to the gates of the Caesarea Praetorium. Struck by the great faith and courage of the Christians, and seeing the firmness of her son in bearing terrible sufferings, Theodosia became repentant and stood in the line of confessors and was executed. Finally the new procurator, Flavian, convinced of the futility of the tortures, sentenced the holy Great Martyr Procopius to beheading by the sword. By night Christians took up his much-tortured body, and with tears and prayers, they committed it to the earth. This was the first martyrdom at Caesarea (303). WHEN THE WOMEN DISCIPLES OF THE LORD LEARNED FROM THE ANGEL THE JOYOUS MESSAGE OF YOUR RESURRECTION; THEY CAST AWAY THE ANCESTRAL CURSE AND ELATEDLY TOLD THE APOSTLES: DEATH IS OVER THROWN! CHRIST OUR GOD IS RISEN,// GRANTING THE WORLD GREAT MERCY. O Supreme Commander of the hosts of Heaven, unworthy though we are, we ever entreat you, that by your supplications, you protect us with the shelter of the wings of your immaterial glory, preserving us who earnestly fall down and cry aloud: Deliver us from misfortunes, in that you are the commander of the hosts on high! MY SAVIOR AND REDEEMER AS GOD ROSE FROM THE TOMB AND DELIVERED THE EARTH-BORN FROM THEIR CHAINS. HE HAS SHATTERED THE GATES OF HELL, AND AS MASTER,// HE HAS RISEN ON THE THIRD DAY! Supreme commander of God, minister of his divine glory, leader of the angels and instructor of men: ask for us great mercy and that which is profitable, in that you are the supreme commander of the incorporeal hosts. SET ABLAZE BY DIVINE ZEAL FOR CHRIST AND PROTECTED BY THE MIGHT OF THE CROSS, YOU CAST DOWN THE INSOLENCE AND BOLDNESS OF THE ENEMY, PROCOPIUS! YOU EXALTED THE HONORABLE CHURCH,// EXCELLING IN FAITH AND GIVING LIGHT TO US ALL! Steadfast protectress of Christians, constant advocate before the Creator: do not despise the cry of us sinners, but in your goodness come speedily to help us who call on you in faith. Hasten to hear our petition and to intercede for us, O Theotokos, for you always protect those who honor you. O Lord, how manifold are Your works! In wisdom You have made them all. vs. Bless the Lord, O my soul. O Lord my God, You are very great! Alleluia, Tone 4: Go forth, prosper and reign, because of truth and meekness and righteousness! vs. You love righteousness and hate iniquity! Next parish council meeting will take place next Sunday (the 15th), following the fellowship meal. Following Great Vespers on Thursday night will be a community BBQ. Bring along something to grill, and a side dish or desert to share. Thursday, July 12 – Great Vespers with Litya, 5.40 PM, followed by barbecue! Friday, July 13 – Divine Liturgy, 7:00 am – Synaxis of the Archangel Gabriel, Our patronal feast day.